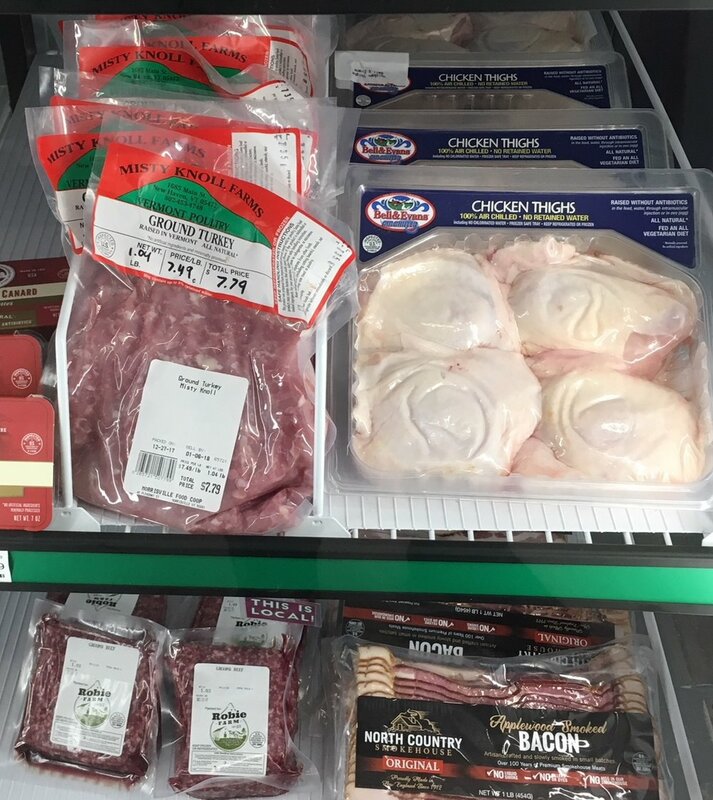 The team at the Morrisville Food Co-Op maintains a focus on quality products from local producers. If you would like to see a product added or have a special order for a bulk quantity of an item, please tell us and we support you in anyway we can. Our selection of produce and local breads are changing daily. If you have not already, come in today to experience the store! Our produce department is teeming with the freshest available vegetables and fruit around. Local farmers harvest and deliver to us, often on the same day. Vermont’s freshest produce will always be at MoCo. Nutritionally dense, responsibly-grown food to keep your family healthy! Our meat and seafood producers bring in fresh local meats daily. Watch our Instagram and Facebook pages to be kept up-to-date so you can secure the best protein sources in Vermont, fresh from nearby farms and waterways in the region. Fresh brewed local coffee is available anytime, and we have fresh-baked breads and other baked goods delivered daily to enjoy on-the-spot or to take home for your family. From artisanal loaves handcrafted by local bakers to the standard dinner baguette, MoCo offers a wide range of breads made within 25 miles of the store and delivered fresh daily. Turn any meal from routine to supreme with a great loaf of bread—the staple of life! All the handcrafted favorites you’d expect plus some regional gems and nationally-recognized brews stock our shelves along with the region’s best wines. Our vintners and brewers pride themselves on producing some of the best spirits in the country. Come sample our selections at one of our tasting events. Are we missing one of your favorites? Tell us! Vermont takes great pride in its full array of award-winning cheeses, and MoCo does as well. Come experience some of the region's finest cheese offerings and let us help you select special occasion fromage to pair with wine or brew for a truly memorable event. If you just need your favorite block of Cabot Cheddar, we'll have that too! Healthy local milk comes from farm to store within hours of milking time. Great yogurt, butter, kefir, and all your dairy favorites will be in abundance at MoCo. Uncompromising quality while supporting local producers is a given at MoCo. MoCo offers a wide range of staples in our bulk department. From legumes to granolas to flours to spices, we keep the freshest bulk items in stock for your convenience. Need a little ginger? A tablespoon of pepitas to top off a great recipe? Our DIY bulk department keeps it on-hand for you 7 days a week. Not a seasoned bulk shopper yet? We will offer "Buy and Using Bulk" keep an eye out for our classes section. Our center store grocery aisles have all your basics covered---great national brands you’ve come to trust, some local one-of-a-kind offerings and some adventurous items to inspire your palate and provide substance to your everyday meals. Cereal, olive oils, baking needs, pasta . . . you get the idea. Great products, value, and customer service beyond compare. Let MoCo complete your shopping list!